Those of us who lived through the Second World War, or grew up in the generations that followed, will have heard many a tale about what the conflict was like, both on the battlefield and on the home front. However, the generation who fought in and lived through the First World War were often less forthcoming about their experiences, making a balanced assessment of the conflict difficult. 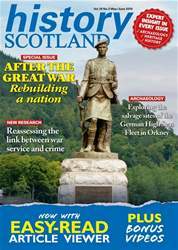 In this special themed issue, historians share new research on the legacy of the First World War, examining what life was like in the interwar period, and exploring how the Great War has been remembered over the decades.